Rising Hope, Inc. provides one year of college-level courses to people incarcerated in New York state prisons. These currently include Sing Sing, Fishkill, and Woodbourne Correctional Facilities. These courses are taught by volunteers, often distinguished in their fields, who freely give their time and expertise to help the incarcerated find a path to living a positive life through education and service. The courses are offered without cost to the students. The curriculum studies Christianity from a scholarly perspective. We do not engage in proselytizing. All faith traditions are treated with respect. Students of any or no faith tradition are welcome to participate in this program. Rising Hope had its beginnings in 1995 when George “Bill” Webber, President of New York Theological Seminary saw the need for post secondary education in prisons. With the help of inmates who had received their Masters in Theological Studies while at Sing Sing, Dr. Webber created the Certificate in Ministry and Human Servcies program. He enlisted the able assistance of Sr. Marian Bohan, PhD, a member of the Ursuline order, who served as Academic Coordinator for several years. Still referred to by some as the CMHS program, the name was changed to Rising Hope when it was incorporated in 2003 and achieved 501 (c3) status. The courses offered are modeled in part on a seminary curriculum but on an undergraduate level. Many other courses have been added over the years. Successful completion of Rising Hope is challenging. Comprised of two semesters, each fifteen weeks in length, with classes five evenings per week, this program asks a lot of each student. Receiving the certificate at our Awards Ceremony brings with it a great sense of accomplishment and new ideas of what good things the future may bring. Rising Hope, Inc. admits students of all races, colors, national and ethnic origins, religions, ages, genders, and sexual orientation to all the rights, privileges, programs, and activities generally accorded and made available to students of the program. It does not discriminate on the basis of race, color, national origin, ethnicity, religion, age, gender, or sexual orientation in the administration of its educational policies, admissions policies, or any other administered programs. 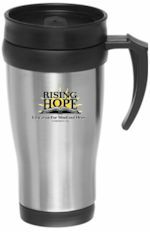 We'll send you this Rising Hope logo travel mug for your donation of $35 or more. Talk to friends about us!